Many farmers combat a volatile market and low prices by developing hedging strategies to mitigate risk. When it comes to developing a strategy there's no one answer that works for everyone. Use this page as a resource for learning more about basic marketing terms, and don't forget to consult your advisor when determining which strategies are best for your farm. The first step towards creating an effective marketing plan is understanding your cost of production. Having a complete understanding of your production costs per acre helps you make better decisions about when to sell your crop. Knowing your cost of production helps you calculate your break-even price, the price you need to sell your grain at to cover the costs of growing it. How are other farmers marketing their crops? We surveyed over 1,000 U.S. growers to uncover trends in how U.S. farms plan, strategize, and make grain marketing decisions. Growing your crop efficiently and producing great yields is only part of what it takes to keep your farm in business. The other part is making sure you sell your crops at a price that covers your costs and makes a profit. Diversifying your crop marketing plan is similar to having crop insurance: you want to protect the investment of capital, time, and hard work your put into growing your crop. When looking at corn price trends year-over-year, we can see that prices are historically higher during the growing season and lower during harvest. It's estimated that two-thirds of farmers are selling in the bottom one-third of the market, meaning those selling their grain during harvest aren't taking advantage of higher prices available at other times in the year. Hedging is a great way to mitigate your risk of not selling at a price that's profitable to your operation. The idea behind hedging is that the cash market prices and futures market prices typically move up and down together, so you can lessen your risk of a loss in the cash market by taking an opposite position in the futures market. Dave S. is a 52 year old farmer who helps run his family's grain and livestock operation in Wisconsin. In this article, he addresses the challenges of successfully marketing a crop, and why diversifying his marketing plan was key to running a more profitable farm. Randy S. farms corn, soybeans, and wheat on his 1500 acre farm in northeast South Dakota. In this article, he addresses how using technology has helped him put more focus on his marketing plan and ultimately make better marketing decisions. A futures contract is an agreement to buy or sell a specific amount of a commodity at a set price. Futures contracts are created by and traded on the exchange. Futures contracts are settled by an offsetting transaction or by delivery of the commodity. Delivery is uncommon, and accounts for approximately 2% of all traded agricultural commodities. Futures contracts are sometimes referred to as "paper contracts" because the physical commodity isn't actually traded on the exchange. Rather, paper contracts representing those commodities are traded. How is my cash price determined? The final price you get for your commodity, or the cash price, is a combination of the futures price plus basis. How is the futures price determined? The futures price is set on an exchange and determined by price discovery (global supply and demand). Basis is the difference between the cash and futures price. Transportation costs, commodity availability, and other factors contribute to basis, which is why the price you see on the exchange is different from your local cash price. A basis is "strengthened" when it improves the price you get for a commodity. A basis is "weakened" when it worsens the price you get for a commodity. Example: A corn futures contract that expires in December of 2019 would be CZ9. If you're buying or selling futures on an exchange through a broker, you'll be required to deposit money with your broker. While there are minimum levels that the exchange has established, your broker's firm will determine the amount of money needed for deposit. Margins are used to ensure the performance of your contract. If you have a short position and changes in the market causes the futures price to increase, you may be required to deposit more money, which is referred to as "margin call". When you sell a futures contract (also called a "short futures" contract), you are agreeing to sell a set quantity of a commodity on a set date for a set price (keep in mind, these contracts are typically not held to expiration and therefore do not have a delivery obligation). When you're ready to deliver your physical crop on the cash market to your local elevator, you would settle your futures position through an offsetting transaction (in this case, buying the same quantity of futures contracts as what you sold to open the position). This is referred to as "lifting your hedge". Selling a futures contract allows you to essentially "lock in" the price you'll net for a percentage of your crop come harvest by offsetting a potential loss for a decline in the cash market price. Example: It's June and you're a corn farmer with your crop in the ground. Right now, the cash price for corn delivered in November is $4.00/bushel. Hedging a portion of your bushels by selling a futures contract would help you offset the risk of a cash price decline during harvest, as a decrease in the cash price results in a gain on your futures position. To keep this example simple, we're assuming a basis of $0.00. Even though you had a loss in the cash market, you offset that loss through your short hedge, making your net sale price $4.00/bushel. If prices increased by $1.00, you would still end up with a net sale price of $4.00/bushel. The main idea behind a short futures contract? Offset the risk of falling prices on the cash market by taking an equal but opposite position in the futures market. With this strategy, you'll have a better idea of the net price you'll get for your grain and can more easily make decisions about in-season expenses. Buying a futures contract is simply the opposite of selling a futures contract. When you buy a futures contract (also called a "long futures" contract) you are agreeing to buy a set quantity of a commodity on a set date for a fixed price if you hold the contract to expiration. Keep in mind, these contracts are typically not held to expiration and therefore do not have a delivery obligation. Buying a futures contract increases your exposure to a commodity market. If the market moves higher, your long position will gain in value. If the market moves lower, your position will lose value. An option is a contract with an expiration date that gives the contract holder the right, but not the obligation, to buy or sell a futures contract of the underlying commodity at a specific price. There are two types of options: calls and puts. Call options give you the right to buy a futures contract of the underlying commodity. Put options give you the right to sell a futures contract of the underlying commodity. Keep in mind, both calls and puts have buyers and sellers. Buyers are buying the right of an option, and sellers are selling the right. Option buyers must pay a premium to the option sellers to buy the option contract. The difference between futures and options is the difference between "have to" versus "can". If you've entered into a futures contract, you have to sell or buy the underlying commodity for the set date and price. If you've entered into an option contract, you can sell or buy the commodity for the set price. The strike price (or exercise price) on an option is the price at which the option holder can buy or sell an underlying futures contract. The option premium is what the buyer of the option pays and the seller receives to enter into the option contract. Just like the price of the underlying commodity, option premiums are determined by buyers and sellers on the exchange. Time until expiration, the level of the strike price relative to the market, and the volatility of the underlying commodity are some of the main factors that contribute to premiums. The premium of an option is determined by two of factors: the intrinsic value and the time. The intrinsic value is how much the option is worth if it expired today. If the option has intrinsic value, then it is said to be "in the money". If the option doesn't have intrinsic value, it is said to be "out of the money". If the strike price is equal to the market price, the option is said to be "at the money". Buying a call gives you the right, but not the obligation, to buy a commodity at a predetermined strike price. If the market goes above your strike price, you are "in the money" and will profit from the difference between the current futures price and the strike price, minus the premium you paid for the call. If the market goes below your strike price, you are "out of the money", and your call would expire worthless. Your loss is limited to the premium you paid for the call. Example: You are a soybean farmer and suspect that prices will go up, but want to sell your crop now to meet your cash flow needs. You buy a call, giving you the right to "re-own" your crop at today's market price. If the market rallies, you can buy beans at today's price and then sell them at the new, higher price. If the market stays flat or falls, you would not exercise the option, and end up with the price you sold your beans for on the cash market. In both instances, you lose the premium you paid to buy the call. When you sell a call, you are selling someone the right, but not the obligation, to buy a commodity from you. You collect a premium in exchange for capping your upside potential in a market rally. This is because when the market moves above the strike price the call you sold is "in the money" and in all likelihood will be exercised by the buyer of that call. If the option is exercised, the strike price plus the premium you collect makes up the final price you receive for your crop. A put option gives you the right, but not the obligation, to sell a commodity at a predetermined strike price. If the market goes above your strike price, you are "out of the money" and your put would expire, worthless. You are free to market your crop at the current higher price, and your loss is limited to the premium you paid for the put. If the market goes below your strike price, you are "in the money" and would exercise your option, selling your commodity at the higher strike price. Your loss is limited to the premium you paid. Example: You are a corn farmer who likes the current market levels and wants to take risk off the table while leaving yourself open to participate in upside if their is a market rally. You buy a put, giving you the right to sell your crop at the strike price. If the market rallies, you let the option expire and are free to sell your corn at the market price. If the market falls, you would exercise your put and sell your corn at the strike price. In both instances, you lose the premium you paid to buy the call. There are three ways to exit an option position: offset, exercise, and expiration. You can offset your option position by taking an equal yet opposite position. Example: If you sold a call, you would buy a call to close the position and be neutral to the market. If the option has value at expiration, it will be exercised. If it does not, it will simply expire, and the only loss you'll incur will be the price of the option's premium. If you are the holder of an option and choose to exercise, both you (the buyer) and the seller of that option will be assigned with a corresponding futures contract at the strike price. The only time a buyer would exercise an option is when it has intrinsic value (in the money). For a call, that means the market has moved above the strike price. For a put, that means the market has moved below the strike price. Cash contracts are used on the cash market (also called the physical market) and ultimately require physical delivery of a commodity. While these contracts won't require the seller to put up margin, there is often a per bushel fee charged by the buyer. A forward cash sale, or cash contract, is an agreement to sell a specific amount of grain for a fixed price to a buyer in the cash market, delivered on a certain date in the future. Both the futures price and the basis are locked. A futures only (or hedge-to-arrive) contract allows you to lock in the futures price without having to set the basis. Before the contract expires, you will be required to set a basis. Some contracts also allow for flexible delivery, in which case you will also need to set the delivery location. There is usually a per bushel fee charged by the buyer (typically 2–3 cents) in exchange for using their hedge account. Your final price will be the futures price determined in the contract plus or minus your basis upon delivery and any fees charged by the buyer. Min/max contracts allow you to set a ceiling and floor for the futures price, essentially predetermining a range for the futures price. Typically basis is not set at the time you enter into the contract, but is set at a later date. There is usually a per bushel fee charged by the buyer of around 2–3 cents. If the market finishes above your ceiling, your final price will be the ceiling you set. If the market finishes below your floor, your final price will be the floor you set. If the market finishes in between your floor and ceiling, your final price will be the current market price. In each scenario, your final price will be adjusted by the fees charged by the buyer. Averager (or equalizer) contracts allow you to price equal percentages of your crop at set intervals throughout a predetermined window of time. These contracts hedge the futures component of your cash price so you are free to manage basis separately. Basis will be set on or before delivery. Your final price is an average of each sale made throughout the predetermined window, plus or minus the basis and any fees charged by the buyer. Basis contracts allow you to lock in basis without having to set the futures price. The elevator will give you a deadline to set your futures price, at which point your basis contract will be converted to a cash contract. Your final price will be the futures price determined in the contract plus or minus your basis and any fees charged by the buyer. Included with a FarmLogs Essentials subscription. 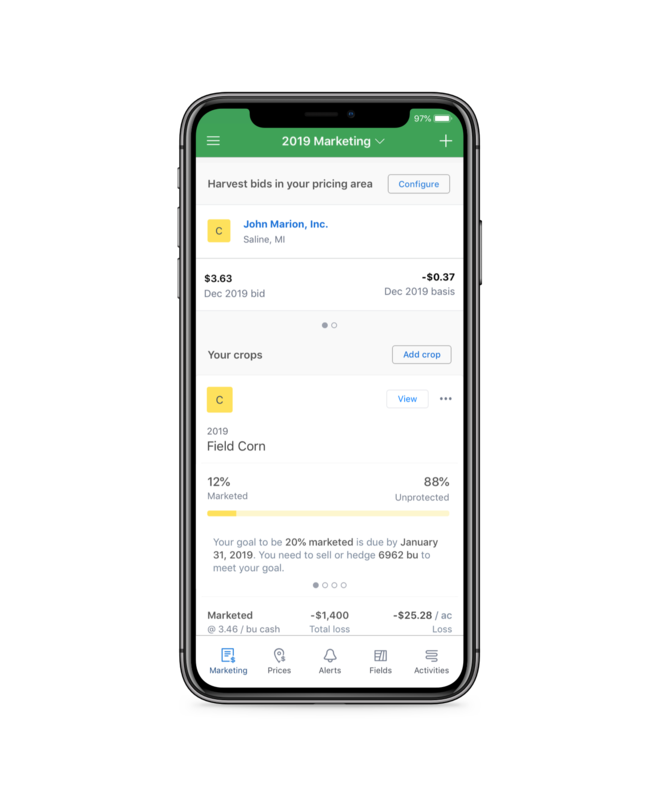 Instantly see how the value of your crops are impacted by current futures prices, track your sales and profitability throughout the year, and set goals to help hold yourself accountable to your plan. CME Group. “Introduction to Futures.” CME Institute, institute.cmegroup.com/courses/introduction-to-futures-html. CME Group. “Introduction to Options.” CME Institute, institute.cmegroup.com/courses/introduction-to-options. Wisner, Bob, and Don Hofstrand. “Grain Price Hedging Basics.” Iowa State University, www.extension.iastate.edu/agdm/crops/html/a2-60.html. The information on this page is for educational use only. FarmLogs is not a stock or commodity advisor. FarmLogs does not advise or offer advice on planning for or executing on marketing strategies. Always consult with your advisor before making marketing strategy decisions. Information on this page is derived from many sources and may not be complete.